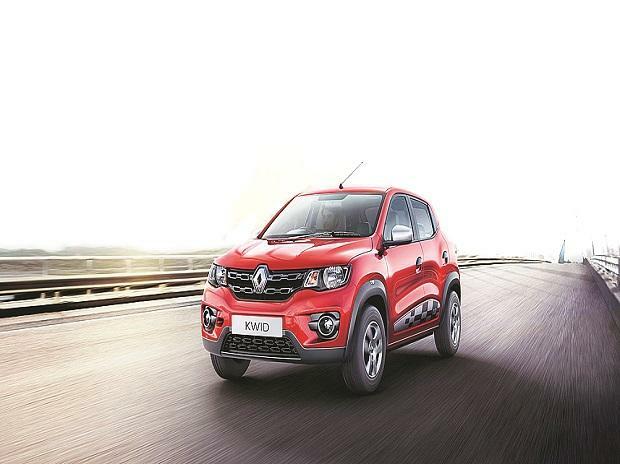 French carmaker Renault had an envious volume growth of 146 per cent in 2016, riding on the success of Kwid. But, 2017 has been a different story. The three-digit growth of 2016 and a bigger base made it challenging to sustain growth. Data shows, the automaker sold 112,492 units in 2017, 15 per cent lower than the previous year. The decline in volume is directly linked to a drop in sales of the Kwid, a SUV-styled small car, which triggered the spectacular growth in 2016. The car, once seen as a strong competitor to Maruti Suzuki Alto, brings 81 per cent of volume for Renault. Kwid’s sales have contracted by 20 per cent during the April-December period of FY18 to 65,572 units. The Alto, which has ruled the domestic entry segment for years, registered a high single-digit growth in the same period and Hyundai Eon has also seen some expansion. Tata Motors’ Tiago, launched in April 2016, may have also hit the Kwid with its monthly volume of over 6,000 units. The Kwid’s monthly average is now less than 7,300 units from over 9,100 units a year ago. Renault’s performance is in contrast to the industry. If we take the first nine months of FY17-18, Renault has managed to grow in just one month (May). The industry by comparison has grown in seven months with a cumulative growth of 8 per cent while Renault declined by 22 per cent, becoming the only company to see a double digit dip. 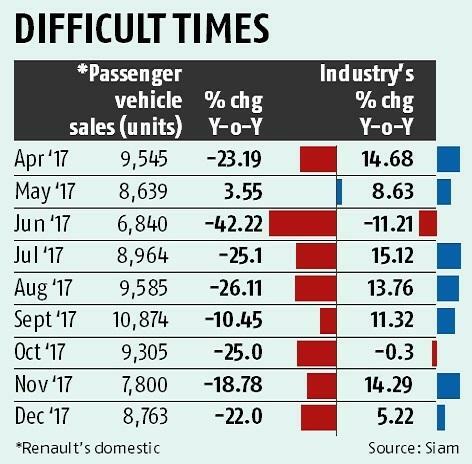 Accordingly, the firm’s share in domestic passenger vehicle market is down to 3.31 per cent from its peak of 4.58 per cent in first nine months of FY17. When the going was strong in 2016, the company had set an aspiration to reach a market share of 5 per cent by 2017. However, Sumit Sawhney, country chief executive officer (CEO) and managing director at Renault India, said in November that the company was ‘still building a runway’ in India. “I won’t say that we have arrived. Our target is to reach 5 per cent and consistently sell at 5 per cent in the mid-term,” he said without specifying a timeline. Renault’s latest launch, the Captur SUV and a product on which the company was banking for some growth, is yet to make a mark. The vehicle was launched at a price of Rs 1 million in November though bookings were opened in September to take advantage of the festive season demand. But of the 1,582 Capturs manufactured in November, the first month of launch, only 1,119 units were dispatched to dealers. Globally, Captur has clocked a volume of over a million units since its debut in 2013. But India volumes are not known. A Renault dealer from Uttar Pradesh said that he lifted two units of Captur and is still sitting with one in his inventory. “There is limited push from the company on the Captur. Renault believes the car will pick up at its own pace,” the dealer said. Renault did not respond to a questionnaire from Business Standard. Industry watchers have said buyers are not excited about the pricing even though Captur claims to offer many industry-first features. While the entry-level petrol variant begins at Rs1 million, the top-end diesel version comes at an ex-showroom price of Rs 1.4 million. Hyundai’s popular SUV Creta begins at Rs 0.92 million and goes up to Rs 1.55 million for the diesel top-end variant. Maruti Suzuki’s S-Cross begins at Rs 0.84 million and goes up to Rs 1.12 million. The Duster SUV is also feeling the heat. The company sold almost 9,800 units in the April-November period, down 26 per cent, and is now learnt to be contemplating a price cut. Many of the 320-plus dealerships of Renault are also sitting on large unsold inventory. “Dealers have carried large unsold stocks of previous year into 2018 compared to the levels in 2017. There is a large stock at the plant too,” said another dealer, who is sitting on an inventory of over hundred Kwids. A number of dealers are learnt to have requested the company to give them only retail sales targets for the months of January and February. These dealers have asked for no billing and sales from the company to their showrooms in these two months to enable them exhaust the inventory.